In the above case you have to go through all pages and remove French language branch using Version Gadget in EPiServer 7, and this process will take forever if CMS is contains many pages. In a nutshell it is not possible to achieve the above mentioned task at least in the UI to delete all pages of a specific language branch at once. 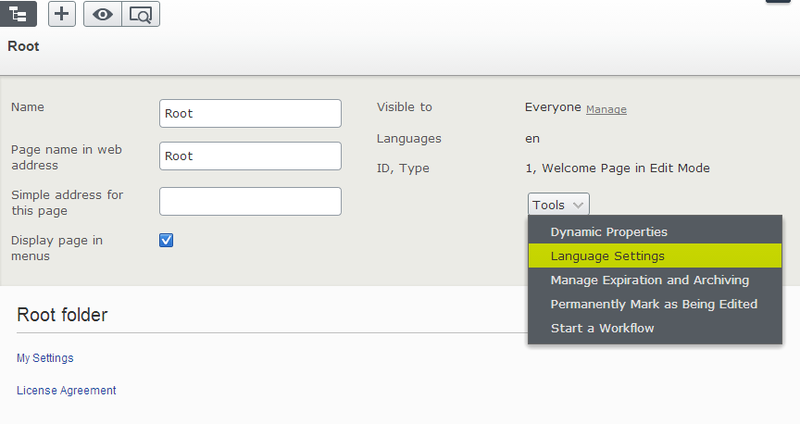 So you have to write a small job in EPiServer to loop through your pages, and delete that specific language branch. There are "delete language" methods in both the EPiServer.DataFactory and EPiServer.DataAbstraction.ContentStore namespaces. These methods take a PageReference or ContentReference as parameter. It means they will only delete the language for the specified page, and not all pages in the content tree. I hope you have got an idea from the above mentioned description, and what needs to be done. We are going to adapt the approach “divide and conqeur” to achieve our goal. Make sure to empty trash just to be on the safe side. 5 - Create EPiServer scheduled job and wrap you the above mention logic from previous steps. Step 1. To get all page types in EPiServer you can get the code from my published post here. Step 5. To create Scheduled job in EPiServer you can get an idea/ instructions from EPiServer official FAQ post.